© Pamela Coleman Smith, 1909. The Magician, the famous card from the Giant Rider-Waite Tarot Deck: Complete 78-Card Deck purchase your deck here! There are quite a few options for one seeking psychic Tarot advising now a days from phone and computer readings to eye to eye reading with well known Psychics and Tarot Card Readers. I have talked to 5-6 Paranormal groups that by no means will go on a ghost hunt unless they consult the Tarot first to see if a place is worth the effort of Ghost Hunting. Ms. Audrey a well known New York Tarot reader says that many come to her and ask her to read the cards and let them know if their apartment is really haunted before they move in. " The cards do tell of ghost quite often" she says. "And they do tell if they are friendly or evil." When asked if she could tell if a house, a person or a thing was haunted by ghosts she said " Yes the Tarot do cover that aspect very well." Even Tarot Cards I have had over the years have become haunted by ghosts!" " And often they are mischievous so I have to retire the deck at that point." Psychic Mickey Of Miami gives an unbelievable tarot reading and some chilling advice on how to find spiritual activity. Mickey says she retires at least five decks of cards a year because a client may bring a ghost with them that just will not leave her deck. Mickey says that in talking with other readers across the United States they all say it seem that tarot cards make a great home for a homeless ghost. One psychic told her she believes the Tarot Cards will actually trap the spirit. "True are not, who knows better or not then the reader," Said Mickey. All she knows is the decks she has are very haunted by real ghost! The haunted decks she says move by themselves. Or give the same reading over and over same cards same position. " I use to consider the decks just getting old and over worked"." I even thought stale left over psychic residue, much like a residual haunting." "Then in time I started questioning the decks and to my surprise they actually told me they were in fact haunted by ghosts!" " I read cards for many different haunted clients, some come with ghosts, demons and strange entities" And many of these ghost often seem to either like me are my cards so much that they decide to take up permanent residence in my decks." Mickey says Tarot cards can open psychic locked doors to the other side. And when getting a reading it is better not to think of the dead for they will come to you in your reading with answers you may not like. She also warns that through a reading the dead often say things we do not want to hear. Many people have not so well to do ghosts or spirits hanging around them waiting for a chance to interact with them. As a psychic Tarot reader of her caliber she has spent many years communicating with spirits of all types. Many wonder is it just a game or the memorizing the meaning to the 78 cards. Often Readers are asked what psychic powers does it take to read cards? Is it a paranormal experience? 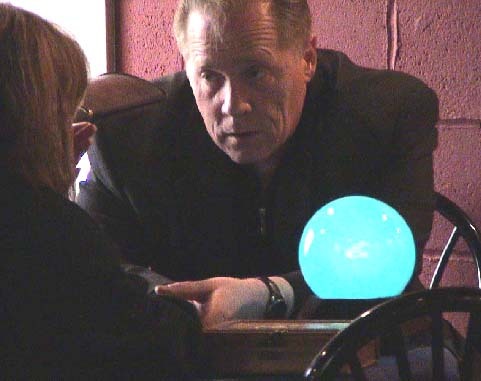 In july 2005 Michael K. Bland and Steve Meyer set out to investigate if Tarot Readers and Tarot cards had any connection to Ghosts and the paranormal. As Tarot Cards are considered part of the occult sciences they were trying to see if any facts and evidence of paranormal activities were afoot. "Tarot is much like a Ouija Board" says Meyer's, "I think it's also a direct link to ghostly encounters." Some Tarot readers in the world have said that their contact through cards have made them sensitive to the other side. And because of this their talents as a medium have surfaced. Bland And Meyer's thought what a better way to investigate haunted objects (Tarot Cards) or possibly haunted people. "Some of the Tarot readers they met told a few real scary ghost stories... And in their eyes you could see they were telling the truth!" Says Bland. Bland and Meyer's use the standard ghost hunting equipment of Cameras, emf meters and digital recordings in this investigation with a few surprising results. The serious question was are these ghost seeking out the Tarot Readers or just visiting with the clients who come to them for readings? When a psychic reveals whether you will live happily ever after, think of Judy Mayer before you dismiss it all as a bunch of baloney. The Winnipegger won $6.8 million in last Wednesday's Lotto 6-49 draw using five of six numbers she obtained during a reading in 2005. Many modern Tarot psychics claim that spirit guides are attached to their private decks. Many believe that spirit guides are chosen on "the other side" by us and God before we incarnate, and that they guide us to follow our life's plan because we want them to. Some people claim it is possible to meet one's spirit guide just by what card falls out most often from the deck when doing readings. Their guidance is said, by some, not to require mediumship. Just look at what card falls out from your deck as you shuffle. Tarot reopens just as you left it. This Ancient Tarot of Lombardy deck is a reproduction of a neoclassical deck published around 1810 in Italy. The original was printed from fine metal engraving plates and hand-colored. The name of the cardmaker F. Gumppenberg is given on the ace of cups (coppe). Tax stamps of the period can be seen on the ace of swords (spade). The card titles are in Italian, and majors are numbered in Roman numerals except for the Fool and Death cards. Numbers for the minor arcana are given in the upper left and lower right corners. The suit symbols follow the Spanish style in that the indiviudal wands (bastoni) and swords are shown separately on the numbered cards. In an interesting reversal of the norm, the Lovers card shows a woman between two men. This deck is published by Lo Scarabeo of Italy and distributed by Llewellyn in the US. Many people consult tarot cards and those who read them for different reasons. to find out about love, money and what dangers lies ahead in the future. But often these readers come across ghost in the cards. "There is no better place to find real genuine Tarot Readers then in one of the most haunted cities there is, New Orleans also one of the scariest places on earth," says Bland." The french Quarter has many shops that offer readings and famous Jackson Square has rows of tables filled with many readers 24/7." " So we sought out the best and most popular to get their opinions and see if they would let us investigate them and their haunted Paranormal claims." the team started their investigation with a ghost hunting trip to New Orleans in August of 2005. One often hears Spiritualists, mediums and others refer to "spirit guides" and other terms. Spirit guide" is a term used by the Western tradition of Spiritualist Churches, mediums and psychics to describe an entity that remains a disincarnate spirit in order to act as a spiritual counselor or protector to a living incarnated human being. some psychics refer to their Tarot Decks as their Spiritual Guides. "Tarot cards can be the voice of the dead." Says Psychic Reese." Many times I might be reading and the meaning of the card is actually telling me a direct message from the other side!" Reese a reader in New Orleans for many years read with the help of a spirit guide he said to those he did cards for. The well Known psychic voodoo King of Bourbon Street has related to us that many times those he read would bring their own ghost with them. And by some paranormal powers they would manifest them selves in the reading. Sometimes giving a message to the love one who sat before him. Or a message for someone not present. Reese actually Told the team that owns several real haunted Tarot decks. The first is the deck he often uses from his mentor and now spirit guide the Late Mrs. Gilbert who he says haunts the deck. " She is my true spirit guide," says Reese. "The deck of cards she first gave me was spooked by the person who taught her it's in what I feel a way to keep their spirit alive." Traditionally, within the spiritualist churches, spirit guides were often stereotyped ethnically, with Native Americans, Chinese or Egyptians being popular for their perceived ancient wisdom, saints or enlightened individuals. The term can, however, also refer to animals or totems, controls, angels or nature spirits even Tarot Cards as a real living entity. Reese believe that many spirits travel with those that come to him for readings and some times these ghosts use the Tarot to speak to his clients. Reese a former Reader at Marie Laveaus' House of Voodoo on Bourbon Street in New Orleans. Says many spirits walked in and out of this most haunted Voodoo shop... including that of Marie Laveau herself and Chickenman. " Many times they would sit in on my readings and often they would manipulate the cards in front of me and my clients to give them a message from a dead loved one!" " Few told him not until they had entered the dark reading room that they had, had no real life ghost sightings until they came there to New Orleans while on French Quarter Ghost Tours." Reese said that many of the spirits that he comes in contact with just want their loved ones to know that they are alright and are still part of their lives. While doing the Tarot reading for Bland the lights flickered 3 times. Emf readings fluctuated and the temperature dropped 8 degrees in the room on this very hot August night. The reading was also recorded and faint whispering EVP voices could be heard on the tape that Reese gave him. As far as asking did he receive a message from the dead? Bland says yes. Reese looked him straight in the eyes and said out of the blue. " Don't cry BOY, Mama will always hold your hand." "These were that last words his mother said to him when she was on her death bed, dying of brain cancer in May 2005." Reese was given a haunted Deck the night before Bland and Meyer's visited him. Reese also tells the strange tale of a haunted tarot deck he owns given to him by a customer who came to Marie Laveaus house of voodoo one night. The lady all dressed in black about 79 years of age came to him one night at midnight. From her purse she pulled out a very old deck of Lombardy tarot cards. It was wrapped in black silk then inside a beaded bag with the image of the moon in real pearls on it. She told Reese they had belonged to her Grandmother who was a witch. The lady went on to tell him that she had read the cards and they told her that she should travel to New Orleans from her home in Vermont and give them to a red haired psychic Tarot reader on Bourbon Street. This particular deck is the one he used for his reading on both Bland and Meyers since they wanted to investigate haunted Tarot Cards. The lady went on to tell him that her cards were haunted by several ghost. Reese was not convinced the deck was haunted until he witnessed one card actually falling out of the deck on its own the main card that always seem to jump out at him was the Temperence card. This card jumped out 7 times when Bland shuffled, and 8 times when Meyer's did. The Temperence cards meaning tells your answer... it is before you in time. Reese still has this deck and it is part of his private collection. He will read someone on it if they ask to contact someone who has passed on. "Just because a card falls out of deck does not mean it's haunted" said Reese. " But this deck makes me feel uncomfortable." At the end of the reading Reese gave the haunted Deck to the team to investigate with the promise that they returned it to him when done. Sadly because of the intrusion of hurricane Katrina on August 29, 2005 The investigation was never completed at the time. But Bland and Meyer's will be catching up with Reese later this year in North Carolina to test his haunted claims further. And return to him the haunted Tarot that they are still investigating to date. Several people offer techniques from experiences they claim say allowed them to meet their spirit guides. There are many published materials by various authors with their own insight into the Tarot and Ghost or occult phenomenon. The Devil's Picturebook: The Compleat Guide to Tarot Cards: Their Origins and Their Usage buy it here now! The Tarot has been the most popular form of fortunetelling for centuries. Some call them the Devil's Picture Book. Paul Huson's trend-setting book on Tarot cards published in 1971 explores the magical and mythological imagery of the famous deck. The New Haven Register recognized it as: "The most comprehensive and illuminating work on these 'mirrors of the soul.' Unique among books on the Tarot." "Tarot Card Ghosts, Contact From The Other Side"
"The Other Side" is much less dense atmosphere than Earth, and so therefore it is believed that we must be tuned in to our guides by freeing the mind or doing one of many meditations. Reese believe that many Tarot readers when they die still want to read cards and help people. that is why they attach their spirit or ghost to a tarot reader or a particular deck of cards. Other regional styles include the "Swiss" Tarot; this one substitutes Juno and Jupiter for the Papess and the Pope. Swiss 1JJ Tarot Deck buy yours here now! Visconti Sforza Tarot Cards buy yours here now! The Tarot is a set of cards used in fortune-telling. A few years ago, tarot cards would have conjured up images of Gypsies, who didn't begin using tarot cards until the 20th century. Today, the cards are popular among occultists and New Agers in all walks of life. According to Grillot de Givry (1971).. The Fool; The Magician; The High Priestess ; The Empress; The Emperor; The Hierophant; The Lovers; The Chariot; Strength; The Hermit; Wheel of Fortune; Justice; The Hanged Man; Death; Temperance; The Devil; The Tower; The Star; The Moon; The Sun; Judgement and The World. Ten cards numbered from Ace to 10 in four different suits; traditionally batons (wands), cups, swords and coins (pentacles) (40 cards in total); and Four court cards (page, knight, queen, and king) in the same four suits (16 court cards in total). The relationship between Tarot cards and playing cards is well documented. Playing cards appeared quite suddenly in Christian Europe during the period 1375-1380, following several decades of use in Islamic. Early European sources describe a deck with typically 52 cards, like a modern deck with no jokers. In the present-day the Tarot is usually seen either as a means of divination, the practice of ascertaining information from supernatural or other sources, or, in a more modern view, as a psychological tool for accessing the unconscious. However, early references such as a sermon refer only to the use of the cards for game-playing and gambling; and in some European countries such as France, Italy, Switzerland, Austria and Germany, as Michael Dummett points out in Twelve Tarot Games (1980), Tarot games are still widely played. The art researcher Maike Voigt-Lüerssen presents in her German language book "Wer ist Mona Lisa - Auf der Suche nach ihrer Identität" the hypothesis, that Mona Lisa was identical with Isabella of Aragon (1470 - 1524), the wife and cousin of Giangaleazzo Sforza (1469 - 1494), official duke of Milano from 1476 - 1494 under the reignment of his mother Bona von Savoyen (1476 - 1480) and his uncle Ludovico Sforza (1480 - 1494). Isabella was daughter of Ippolita Sforza and with that her grandmother was Bianca Maria Visconti, who is suspected to be strongly involved with the Invention of Trionfi (Tarot) cards in 1441. Facsimiler reproduction of 74 extant cards from the 15th century plus four cards recreated to replace cards missing from the initial deck. The original cards are now divided between the Pierpont Morgan Library in New York, the Accademia Carrara, and the Colleoni family of Bergamo, Italy. Maike Voigt-Lüerssen makes herself known for having researched renaissance pictures for more than 17 years and gotten a diploma in history. She has published various books to contemporary themes. Her thesis is documented in the web by lots of until now rather unknown picture material. Texas Professional Tarot Reader, and Teacher S. J. Evans has been in practice for over 42 years. "It's a great gift of God. I knew from when when I was very young. It's an insight -- to find people's vibes and feelings," she says while lighting a cigarette. "I feel vibes -- the character within the person." " I also feel see and here ghost that try to talk to me through my cards". According to Ms. Evans, who is a direct descendent of John Wesley Hardin. Her mother spirit Wanda and grandmother Joy Hardin or John Wesley could also reach into the ether and communicate with spirits directly. But she makes it clear that a gift like this can only be nurtured, not taught. So, what exactly are these spirits? "I won't say just ghosts,"says Susan. " She sometimes feels things from the people around her. "It's not an on/off switch. But since the early age of 5 John Wesley haunted me and I did not know it was him until I found Tarot Cards and learned the answer. Sometimes I feel things that are unwelcome around me and I know it's John Wesley telling me to beware!" "I listen to him always whatever he says I do." John Wesley Hardin (May 26, 1853—August 19, 1895) was an outlaw and gunfighter of the American Old West. He was born in Bonham, Fannin County, Texas. Gunfighter: An Autobiography BUY IT HERE NOW! That if he was shot in front it was good marksmanship and if he was shot in the back of the head it was good judgment. These sayings are probably urban legends. His autobiography, completed to the beginning of his law studies in prison, was the subject of some litigation and was published in 1896. Hardin was an unusual type of killer, a handsome, gentlemanly man who considered himself a pillar of society, always maintaining that he never killed anyone who did not need killing and that he always shot to save his own life. Many people who knew him or his family regarded him as a man more sinned against than sinning. The fact that he had more than thirty notches on his gun, however, is evidence that no more dangerous gunman ever operated in Texas. Eventually, Hardin was captured but entered prison with a pre-law degree he had earned along with his brother. He finished his law degree while incarcerated. After serving 17 years in prison Hardin was released, and he began practicing law as an attorney in El Paso, Texas. Despite his law practice, Hardin was frequently drunk and violent, often demanding his money back at gunpoint if he lost at cards. Rumor had it that he was haunted by past atrocities. In 1895 he began work on his autobiography. So can a psychic like Evans see into her own future? "No not all the time," replies Evans, elaborating that nothing specific can be seen clearly. "I only feel something bad or ugly coming when I feel John Wesley in the cards." Unless my mother or grandmother start talking to me through the cards to tell me someone's going to die. But it was John Wesley Hardin's ghost that told her to move to Texas in 1994 and that her mothers life was hanging in the balance. This warning from him was nothing that she would ever ignore. "If John Wesley Hardin Tells me to do something I do it." says Evans. "I only use the Aleister Crowley Deck" says Evans, "I think it is the most hauntingly beauteous deck in existence." Thoth: Tarot Deck buy "YOURS" here now! We welcome unsolicited ghost photos and stories. LOOKING FOR A NEW DECK OF TAROT CARDS?